Lamb used to terrify me. 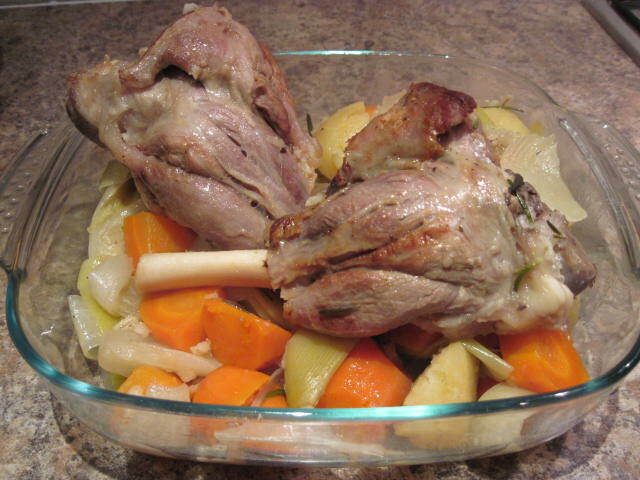 I either cremated it or it was still bleating – there didn’t seem to be a happy medium – until I invested in an electronic meat thermometer. Now I just set the temperature, pop the meat in the oven and wait for the alarm to sound. Genius. 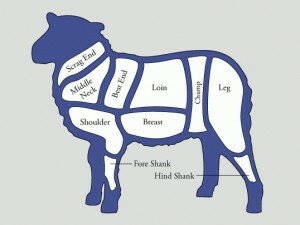 Today’s lamb was cooked until it was 65C in the centre, and then rested for 15 minutes. The end result was succulent, moist meat which melted in the mouth. I used the Knorr website to check the recommended temperature. As regards the cut of meat I chose, the chaps at JT Morgan in Cardiff Market helped me decide. I explained how many it was for and how I proposed to cook it, and we took it from there. 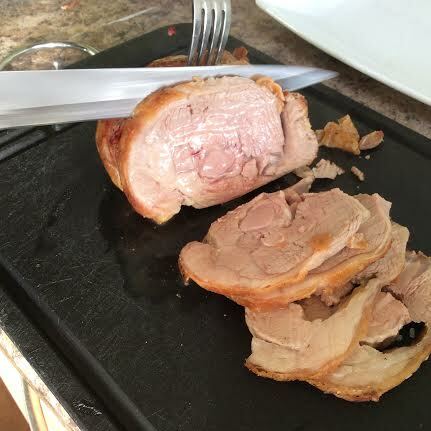 Today’s joint was a ‘cushion’ of lamb, created by rolling the chump area of the lamb (where chump chops come from) into a short, fat, boneless cylinder. 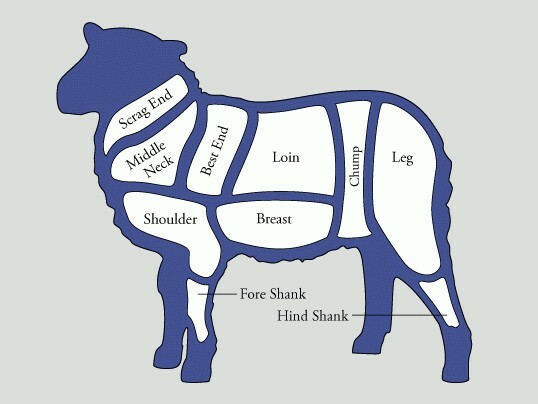 To give you an idea of which part of the lamb I’m talking about, this might help. It always pays to talk to the butcher if at all possible, but if not try to learn what comes from where on the animal and how to cook it, so you know what you’re buying. There’s nothing worse than picking up a pre-packaged joint of meat in the supermarket and then finding it needs slow roasting for hours, when you need it on the table by lunchtime. 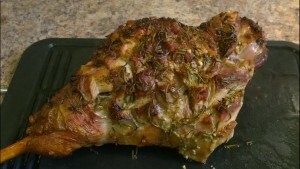 This little beauty took 25 minutes cooking time, with a 15 minute rest, perfect for Sunday roast. I’ve written this recipe for four people, but it’s easy to scale up or down. Heat the oil in a frying pan and season the meat. Fry the meat on all sides for a couple of minutes until golden brown. Transfer to a prepared meat tray, stab the meat thermometer into the centre and pop in the oven at 190c until the alarm goes off (approx 25 minutes). 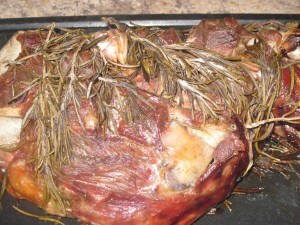 Remove from the oven, wrap loosely in foil and leave to rest for 15-20 minutes. Dauphinoise: the recipe is here, just double the ingredients. Melt the butter in a medium-sized saucepan over a medium heat. Add the shallots and cook, stirring, for 4-5 minutes until softened. Add the frozen peas and vegetable stock and heat until the peas are just cooked. Stir in the fresh mint leaves and cook for a further 5 minutes. Sieve the mixture (reserve the liquid) transfer to a food processor and blend to a purée – stop blending when you have the consistency you like – add more of the reserved liquid if the purée is too thick but don’t let it get too sloppy. Season generously. If you prefer, you can make the purée several hours in advance ,pop it into a bowl, cover and chill in the fridge. Reheat gently when needed. This is a no-brainer, delicious sauce to have with roast meats, and it keeps in the fridge for 3 days, and can be frozen too. Boil the vinegar and the stock in two separate pans until reduced by half. Combine the two and add the sugar & seasoning. If you prefer it slightly thicker, continue to reduce until the desired consistency is achieved. 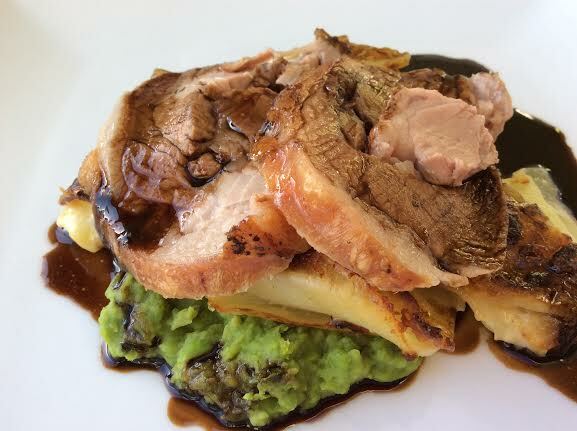 Spoon the pea purée onto the plates, add a wedge of Dauphinoise, and pop a couple of slices of lamb on the top. Drizzle the jus around the edge of the pea purée.